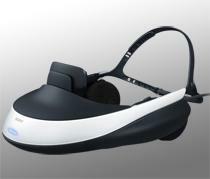 Sony's Personal 3D Viewer Out in UK - US Release Tomorrow! If you're looking for a 3D experience that you don't have to share, the HMZ-T1 is the way to go. Despite the flaws present in a personal media viewer - tiny sweet spot for viewing, discomfort or incompatibility with glasses, looking like a tool - the idea of being able to lay back and enjoy a 3D movie with 5.1 surround without anyone else bothering you is pretty slick. Sony boasts an immersive experience that's like "you're sitting 12 feet away from a 150 inch screen" just like being in "your very own movie theater." It offers a pair of OLED displays and, of course, you don't need to put on any additional glasses for the 3D experience. Sony's 3D personal media veiwer, the HMZ-T1, is available in the UK now and will be hitting the states on Wednesday the 26th. You can preorder it directly from Sony or pick it up on Amazon. Either way, you're going to be shelling out $800.